In testimony before the Senate Budget Committee last week, Doug Elmendorf, Director of the Congressional Budget Office (CBO), confirmed that policies informing President Obama's jobs plan would be far more effective than policies favored by Republicans. In the table are CBO estimates of the potential effects of various policy options on employment. The single most effective way to create jobs is to increase aid to the unemployed, because they are most likely to spend the money and stimulate the economy. Democrats favor extending unemployment benefits. Republicans are opposed. Extending Obama's payroll tax reductions for employees and reducing employer's payroll taxes for businesses that increase their payroll are also quite effective. Continuing reduced payroll taxes for employees is the only tax cut that Republicans oppose. 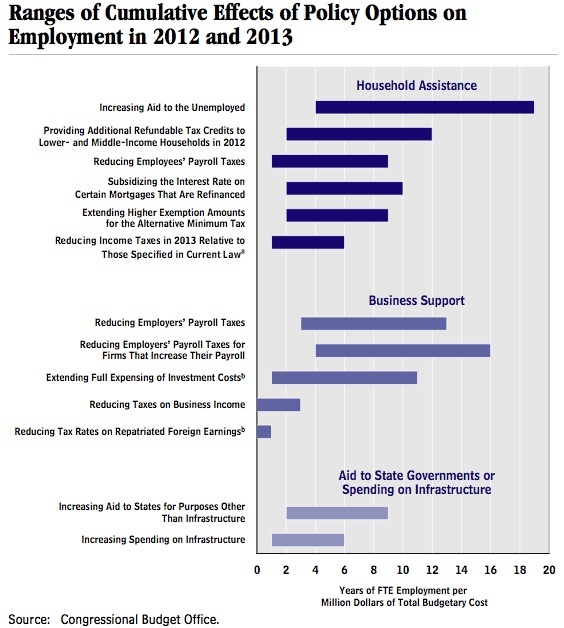 Next most effective at creating jobs would be additional refundable tax credits to lower and middle income households. Among the policies that according to Elmendorf's testimony would have little or no effect on employment are reducing taxes on business income and reducing tax rates on repatriated corporate foreign earnings. Republican claims in support of these actions are pure pandering. Republican prescriptions would have little effect beyond further enriching wealthy individuals and multinational corporations, their corporate officers, and their stockholders. By refusing to pass the president's plan Republicans are hurting the economy and causing unemployment to stay high longer than necessary. Great blog... keep writing. The push back against the liars is a vary, very good. I have added you to the links from my blog. Thanks, Cleat. I like your blog too, a lot. How interesting that we began our blogs within days of one another and for pretty much the same reasons. Keep up the good fight.